Online Vault uniquely combines two must-have tools - Password Manager that remembers your passwords and Form Filler that fills in Web forms for you. Completing long registration and checkout forms can be a nuisance. 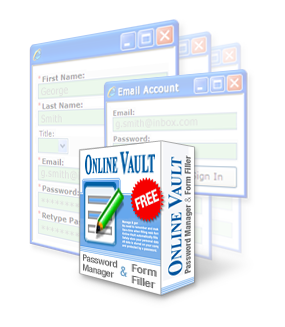 With free Online Vault you can avoid manually filling in Web forms and logins on websites. Online Vault will automatically fill in Web forms for you! Can't remember your passwords? No problem, Online Vault's Password Manager can remember all your passwords and automatically log you in! Don't spend your time filling in Web forms and trying to remember your passwords. Make it easy yourself and download your free copy today!